The increasing trade and tourism ties between the UAE and Azerbaijan received a further boost with the launch of the first scheduled flights linking the UAE capital Abu Dhabi and the Azerbaijani capital Baku by Etihad Airways. The inaugural flight, EY297, departed Abu Dhabi on March 21 carrying a special delegation including diplomats, dignitaries, media representatives, and senior members of Etihad Airways’ management team. On arrival in Baku, the aircraft was greeted with a traditional water cannon salute, followed by the customary display of the Emirati and Azerbaijani national flags from the cockpit windows. 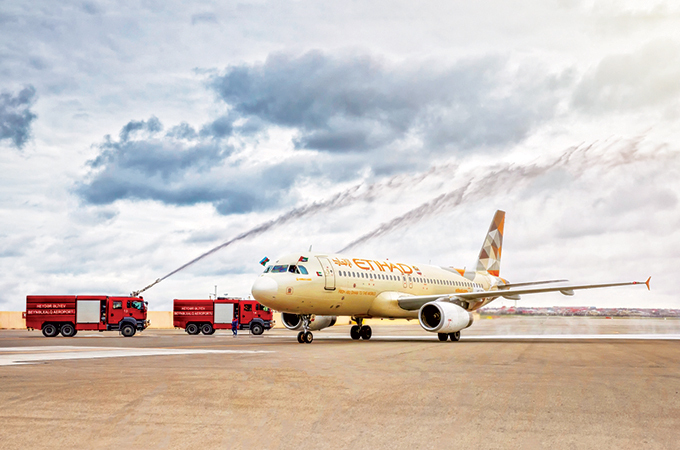 Flying three Times a week using a 136-seat Airbus A320, configured with 16 seats in Business Class and 120 in Economy Class, the new flights will operate every Wednesday, Friday and Saturday, providing optimal daylight timings for guests departing and arriving in Abu Dhabi and Baku. Jahangir Asgarov, president of Azerbaijan Airlines, said: "Azerbaijan Airlines and Etihad Airways are long-standing partners in civil aviation. The launch of joint flights between our two airlines will allow Azerbaijani citizens to further expand their global reach, attracting increased numbers of tourists and creating more opportunities for business travellers."